Welcome to Island Canvas! 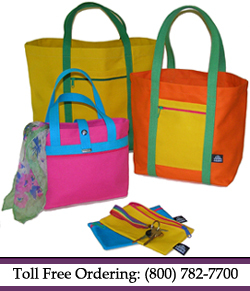 Your one-stop shop for colorful, useful canvas bags - great for shopping, travel, business or sports gear. For 35 years we have been hand crafting our bags of the finest materials. Each item is individually made in Red Lake Falls, MN with care and attention to detail to ensure you years of quality service. Our popular and stylish Island Canvas products are hand made of tough, durable 100% cotton duck which is mildew and water resistant. The cotton web handles provide maximum carrying strength. Each bag is fitted with an industrial rust-free zipper solidly stitched for good looks at a reasonable price. So browse our product line and enjoy creating your own custom color combination of any of our line of fun and functional bags. Don't see what you need? Island Canvas is a small company dedicated to providing individual attention to each of our customers. We would be delighted to hear your idea for a custom design Island Canvas can create especially for you.